We’ve been too long away from the Masters Of The Universe newspaper comic strips. Thus far the stories have been enjoyable, and tonight’s offering is no different. And this time we get a bit of Eternian lore. Not much, but just a little bit. There are also a few things here that will lead into other stories, so I won’t be mentioning them here. 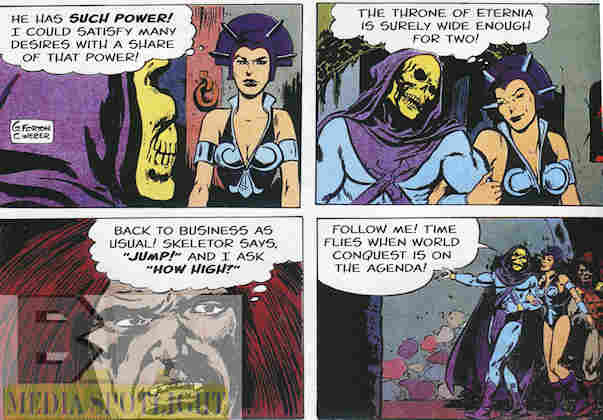 This time Skeletor has a new plan to lead He-Man to his doom. It’s a simple plan really. Just get one of the Heroic Warriors to attack him so He-Man has to come to his rescue. And as dumb as this plan sounds it makes sense in context, although it requires a certain pet peeve of mine in magic stories. Luckily the rest of the tale makes up for it. He-Man is doing some repair work in the caverns under Castle Grayskull when he finds another door guarded by a falcon statue (and this time it stays a falcon–no hawk at first like in “Vengeance Of The Viper King“) This is part of our spoiler for this storyline so I’ll bypass it for now. Besides, it’s really just a plot device for our main tale. Knowing that if someone tries to destroy Snake Mountain He-Man will have to stop them (I’ll get into that in a moment), Skeletor plots to trick Clamp Champ into coming to do just that to lay a trap for He-Man. To get there quickly He-Man will have to face the challenge of corrupting power in order to save the day and himself. Otherwise, Skeletor is a dead man! Let’s just get the problems out of the way because I need to talk about the first big problem now, so why not group them together? Why can’t He-Man allow Snake Mountain to be destroyed? Because of what we Earthlings (and for once the Earth reference is actually credited to Earth) call “yin and yang”, the Chinese concept of balance between good and evil which must always be maintained lest chaos ensue. Ignoring my own spiritual beliefs or moral thoughts on the subject of good versus evil, I’m not even sure the concept is being used correctly. Of course I’m no expert on the subject but I get the impression that writers of mystical-based stories, be it Masters Of The Universe like here or Jackie Chan Adventures, a show heavily influenced by Chinese (and in a later season Japanese to freshen things up) mysticism, use this to explain why the heroes can never truly defeat the villains (because “we need to keep the stories going” or “we need to keep selling the villain toys” is a bit too meta), lest a “worse evil” arise. Like I said I’m not the guy to ask, but this is a cliché I’m tired of seeing. Oh no, please tell me we’re not getting a Skeletor/Evil-Lyn romance! This comic is getting sappy enough. The other problem is Teela. Look, I have nothing against Teela being attracted to He-Man. We saw some hints in the Filmation series (although she once said her ideal man had, if memory serves, He-Man’s courage and Adam’s heart or something like that), although that would be the only continuity I can think of and this one is being created by former Filmation contributors. However, watching her act like a lovesick teenager is just odd. You can have Teela have feelings for He-Man without the levels we’ve seen in the past two stories. In this story it’s worse and kind of pulls away from her strength to see her constantly searching the crowd at a dedications for signs of him despite He-Man rarely coming to such things (since he needs to be there as Prince Adam more) while brushing off even mild conversation with her friend Adam. It’s even tied to how she ends up joining the mission to Castle Grayskull. He-Man gets a superpowered form (no spoilers) but it’s just a crown and cape, while Skeletor doesn’t even get that. The story also opens with He-Man thinking about his “new armor”, but if he’s wearing it now it’s just his usual harness and bracelets plus his fuzzy shorts and boots. What was the point? But enough complaints. Let’s talk about the good parts. And there are good parts. There are set-ups for potential stories. Miranda gets a promotion to ambassador. Gwildor is working on a new project blending magic and science (big deal–this is Eternia; they already are practically the same thing at times) including creating a “magic detector”. And Randor has created a spaceship fleet to trade with other worlds. All good prospects for upcoming stories. The action is good and the character moments are good (Teela’s lovesick teenager aside) as we see more of Clamp Champ’s ego and Skeletor’s spy messing with one of the councilors. Even Evil-Lyn gets some personality when she’s willing to share Skeletor’s power as Skeletor oddly charms her while actually giving Beast Man a complement even while putting on a probationary collar on him that zaps him every time he thinks something bad about Skeletor. Skeletor being charming? Who are you and what have you done with the REAL Skeletor? The theme of the story is He-Man’s fight with a corrupting influence although we don’t see that until the fight with Skeletor near the end. It’s not the first time a He-Man story has done this, nor will it be the last. Longtime readers may remember the MV Creations story I reviewed that also dealt with that, while Zodac tested He-Man in one episode with the Starseed in the original cartoon. It’s fractionally the same plot but with a different enough take and I’m curious if the crown and cape will ever be used again. Personally I’d rather see him use some of the armors and weapons from the toyline, but I don’t think this comic does that. At least there’s the minicomics. So overall it was a good story, maybe a little weaker than the others thanks to the plot device and Teela’s mooning over He-Man but still good. Next time our heroes must face a new threat in “Revolution In Rondale”. Posted by ShadowWing Tronix on January 17, 2018 in He-Man Newspaper Comics and tagged Castle Grayskull, Clamp Champ, Comic Strips and Panels, He-Man, Masters of the Universe, Skeletor, Snake Mountain, Teela. Skeletor and Evil-Lyn would make a great couple;) Based on the comic strip segment you show and what I remember from browsing through this book before, I’m still amazed by how different that Beast Man looks in these newspaper comic strips when compared with the cartoon, the mini-comics, and the comic books of DC, STAR (Marvel), and Image/MV Creations. This Beast Man doesn’t look as beastly as the one in the cartoon, mini comics, and various comic books. I like how this story sets up situations for future stories. That’s always a positive thing in a strong tale….more great adventures ahead!